Invertrain produces buildings based on past or present railway prototypes. They are not meant to be 100% accurate copies of the original. They do, however, closely follow the prototype and are designed to reflect the character, look, style and size of the original. The kits are complete with glazing and accessories and require only adhesives and paint to complete. Most of our models are constructed from resin castings produced from hand-finished moulds. Windows, doors, etc. are mainly cast in resin but in certain cases will use stone cast plaster, etched brass or whitemetal castings. Further details regarding individual buildings are shown in the lists below. Highland Castings now manufacture the building kits under their own name. The kits will continue to be sold through Invertrain Model Railways. Platforms, bridges and walls You’ll not find these anywhere else, so if it’s our Complete Stone Platform Edging System or our Bridges and Walling you’ve been looking for, then you’ve come to the right place! Too busy building baseboards and laying track to paint details? If so, why not choose from our growing selection of painted and assembled items? Bring your layout to life with our figures, either painted or unpainted. Whether you’re looking for timetables to help your 1:43 scale people catch their trains, posters or news to distract them from their missed connections or signs for the local garage we’re confident we have something here for you. All wheels have a steel tyre, moulded centre, steel axle and are chemically blackened. Upgrade your existing coaching stock, or complete that kit which is sitting in the cupboard. All buffers have a whitemetal body, sprung turned head and come ready assembled. Whether it’s the right set of lamps to finish off your model, couplings for your new wagon or even coach connections, this is where you’ll find what you need. We stock the full range of Scale Signal Supply kits and accessories. Extensive research has gone into the design and production to enable the modeller to produce a signal that has all the characteristics of the prototype. The kits contain all the necessary parts to produce the model. Only solder, glue and paint are needed to complete. Full building and painting instructions are included. From time to time we have ready-to-run O gauge rolling stock available for you to buy. These models will either be brand new or pre-owned, as stated in the description. We have a comprehensive range of wagon loads to fill those empty wagons and add useful weight if required. Made from stonecast plaster, whitemetal or resin, from manufacturers such as Highland castings, Ten Commandments, Duncan Models and PLM. f your layout has a road on it, you will need a vehicle to complement it. Choose from a horse-drawn wagon to a modern lorry. As an agent for Parkside & Slaters, I can supply from stock, or to order within a few days. I can also source kits from ABS, Springside, Haywood, JPL, Powsides and others. I also have other kits in stock from time to time which will be listed here. What about all those empty fields and farmyards? From pigs to pigeons and horses to Heron, we have got the lot. 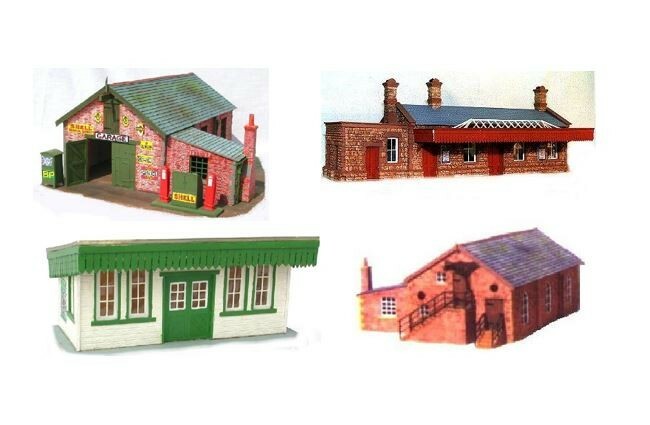 From time to time we will have ready-built O gauge buildings or lineside structures available for you to buy. These models will either be brand new, pre-owned or be an ex.demonstration model, as stated in the description. Axleguaeds an essential item to assist the wagon modifier or scratchbuilder. Motors and gearboxes the essential items required to ensure good performance from your favourite locomotive.